You are here: Home / Guest Appearance / MightyOhm Appearance / #365 – Wait, why is Jeff glowing? #365 – Wait, why is Jeff glowing? Welcome back Jeff Keyzer of Mightyohm.com! Jeff will be in New Zealand in December! Hit him up on his twitter (@mightyohm) to schedule a time to hang out! He is now making more kits for Mightyohm.com! The LIGO facility is also there. Thanks to Jeff for being on the show! The picture at the top is the tubes in the B Reactor. For more pictures follow Jeff on Twitter or on Instagram. LIGO is really, really cool. Folks worked on that thing and other interferometers like it for decades and finally got them sensitive enough to detect gravitational waves propagating in the universe (different from gravity waves like waves in the ocean driven by gravity, mind you). Empty space itself going wibbly wobbly once in a while and Einstein predicted that too, right on the money! We now have a new way to detect the previously unseen and unheard, and historically every time that has happened it’s been a big deal. 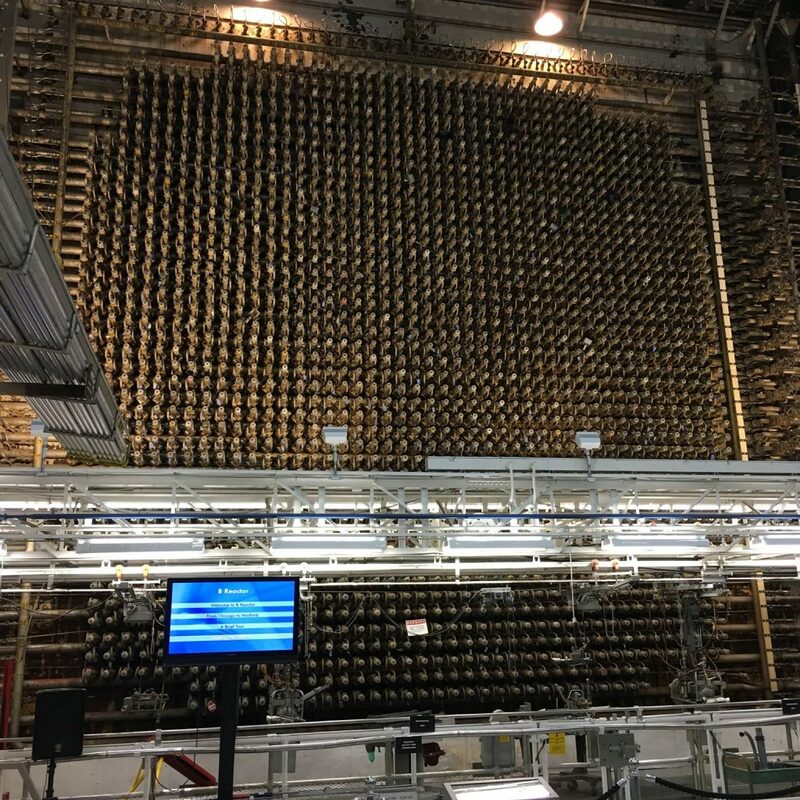 The microscope, the telescope, the radiotelescope, X-rays, nuclear reactions, you name it… That tour of the Hanford site sounds like fun. Of course much of LIGO itself is “just” two long vacuum tunnels in the ground but the stories they can tell are something else. There’s also a second LIGO site in the states and the third interferometer in Italy is now operational also, so they can accurately triangulate the source of new detections. A Jeff Keyzer episode and it’s only 1:23 long? I feel like we should have got more. As for nuclear engineering no longer being a career because they aren’t building new nuclear plants — this isn’t true. There are a couple under construction in the US and five more planned. And 50 under construction worldwide. Correct, the nuclear industry isn’t going away and the world couldn’t afford that anyway. In the near term the number of operational reactors can be expected to go down slightly as the oldest plants start to get retired but overall the figures are stable. The total installed generating capacity can actually be expected to increase by at least some 25% as the units under construction are larger than the reactors being retired. (Whether small modular reactors change the game remains to be seen!) Each one represents decades of carbon neutral power generation at an unbeatable, very high >90% capacity factor (the fraction of the time actually spent generating). That is supremely valuable in a world hungry for electricity – but we don’t actually always price it that way (CO2 footprint + actual available supply on the grid), not yet at least. Some alternatives (and the long distance transmission infrastructure they may require) have very low capacity factors meaning they sit idle way over half the time and need to be, say, over twice as valuable when they do supply us with energy. The actual value (demand) however follows its own rules with the daily demand peak after sunset and the annual demand peak in the winter. Matching supply and demand is an ongoing struggle. Jeff mentioned that reactors have a ‘gain of a little over one’, but that isn’t always the case. It depends on the moderator. Some modern reactors use pressurized water as the moderator. These reactors have a gain of one. As the reactions in the reactor increase so does the temperature. This then lowers the density of the water which in turns slows down less neutrons and allows more to escape the reactor. With less slow neutrons to cause further reactions, reactor power goes back down to some steady state. Conversely when reactor power goes below that steady state the opposite happens. As the temperature goes down water density goes up and slows down more neutron. Thus more neutrons are available to interact with the uranium.